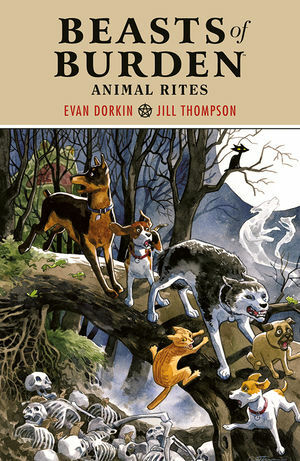 Five canines Ace, Rex, Jack, Whitey, Pugsley and a feline named Orphan are out solving cases for animal-kind. This world is a nostalgic one where sometimes they recall their time with their masters in relation to their cases. Quite often they are in the background much like a Peanuts strip, and are usually unimportant to the key narrative. “Stray” unearths the bones of a dog whose spirit is not at rest. All he wants to do is to reunite with his family. The second tale, “The Unfamiliar,” introduces Dymphna, a black cat. The obligatory reference to evil witches and cult of Sekhmet can be inserted here and the next group of chapters details her fight with the gang, and eventual change to turn her life around. This work focuses on relationships first and the supernatural realm second. These “pets” are very creative in figuring out what’s going on in their neighbourhood and are very resourceful. A group of “Elders” help aide them. I discovered them two years ago when I chanced upon a used copy Dark Horse’s Book of the Dead and, like them, been on the hunt to understand their past and explore their future. Had Sherlock Holmes opted to have pets help him in his cases, I am sure he would want to recruit the entire gang! Not only are they adorable (Thompson’s artistic style simply shines here) but also they are relatable. I often played with my neighbour’s pets when coming home from school, when their owners are still at work, and wondered what they have been doing when humans are away. With this work, it lets my imagination go wild and recount those days — especially when there is a creepy house I often shun on the way home. I believe they are just as intelligent as we are. The only barrier is that communication is never straight-forward. The standout chapter in this 186-page collection is “Something Whiskered This Way Comes,” where Dymphna’s turnabout is explained. Technically, this tale is Orphan’s solo adventure. When the two partner up, there’s a Studio Ghibli-style of adventure coming up that’s best left summarized as you better watch out for the Rat King! The afterward explain how the Beasts of Burden Hill (the neighbourhood they live in) came about. The last couple of pages are Thompson’s sketchbook and her notes offer a few insights. The watercolour images are simply fantastic to look at, and the day she has an online shop open, I will have to buy prints of her work to hang on my wall! Ever since I discovered her in Sandman #40, I have been hooked! Her sketch of Chibi Sandman and Death are all too adorable, and this ability to create cute is more than easy for her to render. And yes, if I had to choose which species I adore more, the cats shall rule. Sorry, Chichi.